The homeschool life is a blessed one but it sure isn’t perfect. Homeschool articles, books, and blogs might give you the impression that life will be all snuggle time, clean house, home-cooked meals, and sweet children. Do you ever worry that you’re somehow failing at this homeschool thing? Do you think that others have it all figured out? Are you still searching for homeschool perfection? Well, go ahead and stop now, because you will never find it. I know I never have achieved blissful homeschool perfection. That is not the reality at my house. I have a few confessions to share with you….. Sometimes I wake up on Wednesday, toss on a t-shirt (this is TX and yes I’m still wearing t-shirts in January), and head upstairs. At the top of the stairs I will realize that I just put on the shirt that I’ve worn the past two days. Same story with the pants. They aren’t truly dirty until the kids have wiped snotty noses on them. I mean, it’s less laundry for me right? Ohh and these “outfits” of which I speak – they are t-shirts and yoga pants. I don’t actually get dressed in real clothes. And I’ll share my shopping secret with you…..I may or may not have bought every color of the same style t-shirt. And I just might have yoga pants in the exciting colors of gray and black. Mix and match and then I have endless outfits, right? I cook all my meals (or at least prep them) on Sunday afternoon. I have a menu plan and I break out all the ingredients and decimate the kitchen. At the end of four hours I have meals that I stick in either the freezer or the fridge. During the week I do nothing more than pull out the meal listed on the calendar and put it on the stove or in the oven. So, our meals are home-cooked but they do see some time in the freezer. I have a simple rule – I will only wipe the kitchen counters once in a day. I usually only wipe them down after the kids are in bed. They sit there all day with crumbs on them. I just turn my head and look the other way. I haven’t seen the benefit of wiping them obsessively all day…..
Ohh and I only do dishes once a day too. Breakfast and lunch dishes get tossed in the sink to “soak” and then I load up the dishwasher after dinner. I refuse to take time out of my day to try to load the dishwasher while I’m trying to keep an eye on the baby or keep the toddler out of her next mess. I don’t do any project that requires more than about 4 supplies. I am not about to run all over town for project supplies. And when I decide to skip a project I’m not above using a YouTube video or pictures on the computer for a demonstration. That’s much less mess for me to clean up, right!? I often forget to vacuum the upstairs. I send the kids on scavenger hunts to collect all the big “pieces” of things on the floor. They race to see who can pick up more things. And then I call it good. The carpet is kinda speckled-looking anyway. If I’m especially tired I call off school for the afternoon and put in a movie for the kids. Then I crash out on the couch and take a 45 minute power nap to make it through the evening. Naps are important. Kindergartners always have their “rest time” at school and on days when I feel like I’m functioning on a Kindergarten level I feel that I deserve my rest time. So, I take that time without any guilt. And this is probably my worst confession. I can’t believe I’m saying this. But………sometimes I answer my kids’ questions with “I don’t know” or “because.” And no, I don’t even go look up the answers or justify my response. I just leave it as one of life’s great mysteries. They’ll figure it out eventually. When my husband comes home from work he finds a pile of dirty dishes, messy counters, mountains of laundry, kids still in jammies, and a wife who looks just like she did two days earlier. That’s just the norm at our house. It’s part of our homeschool life. One day I know I’ll miss these years! Go ahead and embrace your perfectly, imperfect homeschool. No two days will look quite the same, and it will be a challenge to keep up with homeschooling and housework while finding balance. 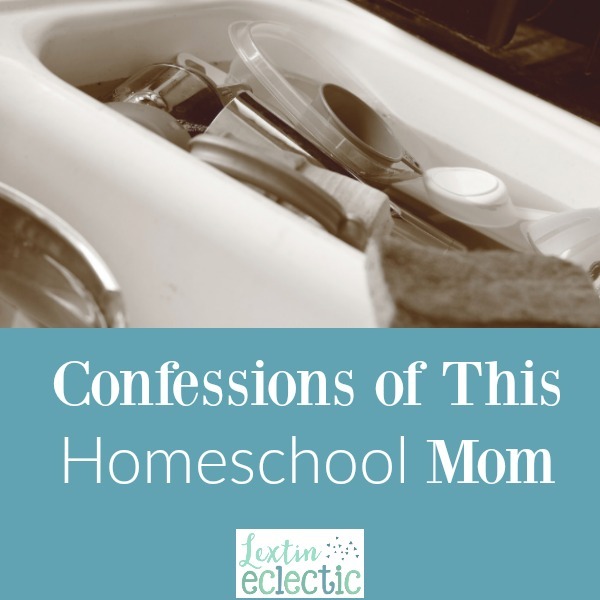 And that’s ok.
It’s time that we were real with each other as homeschool moms. None of us can do it all. No homeschool is picture perfect. We can confess our shortcomings and hopefully even laugh about a few of them. My confession, I've been storing clean laundry in my now two yr olds old playpen. I figure at least it's clean and it not on the floor or in the chair. I knew I liked you for a reason! 😉 Glad I am not the only one doing these things- thanks for the giggle! I love this post Lexi!! I have really grown to hate those stories of perfect homeschool families 🙂 Who can live up to that? I love this list of confessions Lexi! Too funny, yet so true! I'm on the Schoolhouse Review Crew with you, and will be sharing the link for this post on my blog's Facebook page as part of our blog share task for this week. I have a whole list of my own confessions! Maybe I will turn them into a post too. love. and I have black and gray pants, too. and t-shirts in every color. we are kindred spirits, my friend. Thank you! It can be hard to admit your shortcomings but it is liberating to admit that you aren't always perfect. 🙂 I am so glad we have the opportunity to have our homeschool adventure even though it can be messy and difficult at times! I wish I still lived in NM. I would come and visit you- you are my kinda woman! love this list- real and fun and doable!